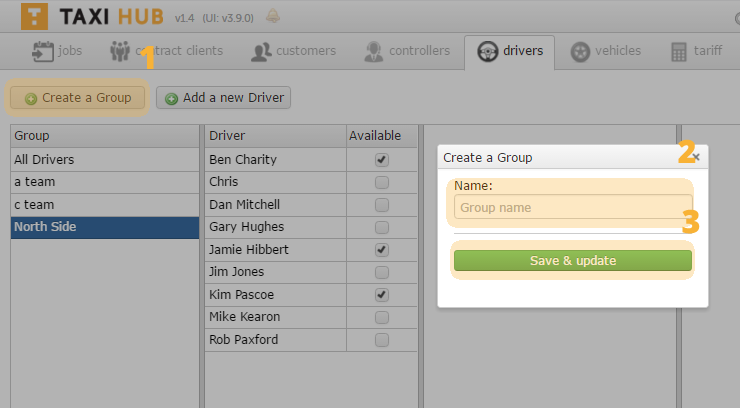 Driver Groups allow you to create pools of drivers which can be selected within the “Planner” function of Taxi Hub. This may be more pertinent to larger firms that for example have 3 teams covering different ranks within one large town or terminals at an airport. You could create 3 groups and name them whatever best describes them to your company eg. North Team, Wharf Rank etc. Tip: Different groups can be opened in planners on different screens and computers to allow easier management of large teams. 2 – Enter a name for this specific group. Once you have saved the new group the popup window will go and the new group name will appear in the left hand column. You can see in the example above All drivers, a Team, b Team and North Side have all been created.